The previous post links to a news story about a ghost in the Shaffer Hotel in Mountainaire. Personally ghosts anywhere and everywhere in Mountainaire wouldn't surprise me. 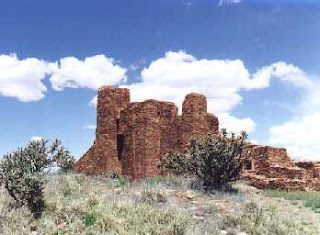 I have been there many times because I like to visit the old Pueblo Missions around there and Mountainaire is pretty much the only near by town to stop and have lunch. There is something so strange about that town. Every time I have been there I feel like I have stepped out of modern America and into the 1930s Depression Era. I think most of the buildings (not that there are many) were probably built then. I suppose some people would find the town quaint, but I find it creepy. The locals in the diner always stare in such a menacing kind of way and quite possibly that is just how they look and they don't mean anything by it, but there is something creepy about people staring at you the entire time you are having your lunch. It isn't just me that feels that way either. Last time I was there three other people were with me and they all couldn't wait to leave that diner and the town. They all found it as creepy as I did.